Advanced Medical Solutions, LLC (AMS) was formed in July of 2002 and has been partnered in business with hospitals and physician groups to create cost effective service and product solutions. The leadership team, with an extensive background in biomedical engineering and cardiovascular perfusion, has a combined clinical experience of greater than 30 years in some of Wisconsin's largest healthcare systems. Whether it be clinical responsibilities, product distribution, or being members of an Accountable Care Organization (ACO), AMS has been, and will continue to be, committed to providing the highest level of care while partnering with our customers in cost savings measures. 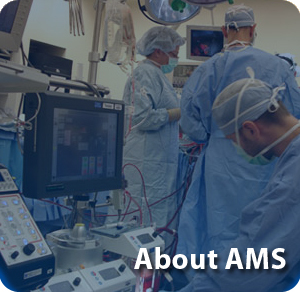 Since our founding, AMS has grown from a small service provider in niche markets to a sizeable one that also is the Wisconsin based distributor of multiple lines of products utilized in various medical disciplines. Throughout our growth our success has been attributable to our reliability, customer service, accessibility and cost saving solutions. This company focus will continue to make AMS a valuable care partner with your business. AMS has many core strengths that make it the best company to provide you with the highest quality of service at a competitive cost. Our curricula vitae are rich with educational involvement, clinical research and surgical experience. Over the past 20 years, we have provided professional leadership to cardiovascular surgical programs at several Wisconsin facilities and to our professional societies at large.